It is always advisable to contact a Museum first to make sure of opening times, and whether what you wish to see is in fact available. Museums may have part of their displays closed temporarily for various reasons. Also, many items of particular interest to you may be held in the Reserve collection. To view these it will be necessary to make an appointment. This list is by no means complete, but we have attempted to record places that are known to us as being of interest to strawcraft enthusiasts. 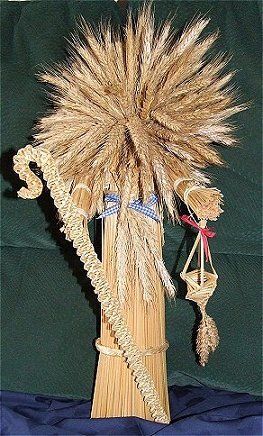 Whilst every effort is made to ensure that the information in this page is correct, the Guild of Straw Craftsmen cannot be held responsible for any errors that occur. We welcome additions, and advice on anything that needs to be corrected. The entries are listed in county order. In the Bee Gallery you will find the last surviving seated straw figure of King Alfred which was restored by Tom Mizon of Horseheath, Cambridgeshire in 2009. The Mossman carriage collection is reported as being the largest on open display in Europe. There are many other interesting galleries and displays, play areas, gardens and a cafe. Allow a day long visit to enjoy all that Stockwood Discovery Centre has to offer. Hats and items from the straw hat industry are displayed in an upstairs gallery of the museum. Besides hats there are spectacular straw plaits, splitters, mills, hat blocks, sewing machines and lots of information. Allow at least an hour to appreciate this part of the gallery display. Other museum highlights include the Luton Life gallery, Bedfordshire and Hertfordshire Regimental Gallery and a small tea room. An exciting new lace gallery, Threads of Life, will open on 4th June 2011. The displays will include Lace and Life in the 1600s and a display of miniature lace kimonos, part of the winning entry at the OIDFA World Lace Congress. Here you can see the large straw effigy of King Alfred made by master thatcher Jesse Maycock, and other straw items. Alec Coker's collection of scrapbooks and photograph albums, and some of Fred Mizen's work is held in the Reserve Collection. You will need to make an appointment to see items in the Reserve Collection. 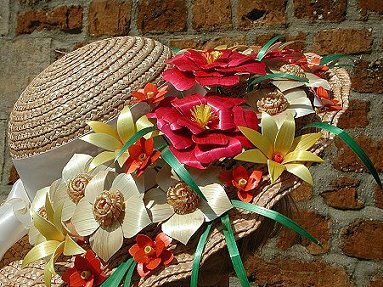 Firstly, a gorgeous fine Straw hat, decorated with silk flowers of the corn, including a wheat ear made of Schn�rli. Further along in the cabinet is the most beautiful white doll's dress, encrusted with Swiss straw work, all the motifs we know so well! Dolls' embroidered dresses presented to the Princesses Elizabeth and Margaret in the 1930s by the French. This small Museum, which received the Museum of the Year Award in 1993, has a modest display relating to straw plait work. The museum is in a 17th century timber framed building. It was the White Horse Inn for 300 years and turned into a museum in 1936. Some objects date back to 1600's. One room contains arts and artisans and included in this are examples of straw plaiting. 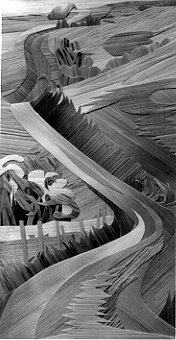 There is a straw plaiting mill, a straw splitter and a small straw marquetry box. But the best exhibit is a plaited straw sun bonnet for horses to protect them from the sun and flies. A splendid display on the top floor of Napoleonic Prisoner of War work. 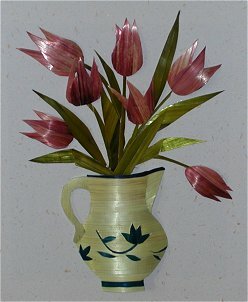 A "must" for those interested in straw marquetry. Many more items are held in the Reserve Collection; an appointment is required to view these. 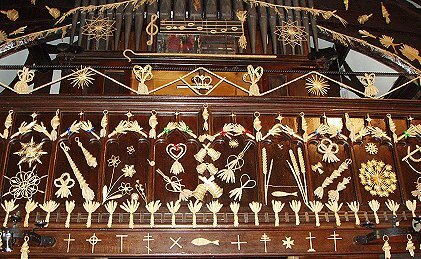 At harvest time, this little church is decorated for Harvest Festival (beginning of October) with several hundred Corn Dollies made by Raymond Rush. The decorations remain until Remembrance Sunday (the Sunday nearest 11th November). Raymond and his wife Hazel live next door to the church where they run a small organic farm. You can stay at the farm house as they do bed and breakfast. Victorian straw marquetry box, wax doll around 1880 with straw hat, various Corn Dollies made by Mrs. W. Bucknall, photographic display of "Crying the Neck" ceremonies at Sithney, 1966 and Cury, 1967. Display boards of Corn Dollies by Joan Rendell MBE (author of "Your Book of Corn Dollies" and "Country Crafts") and Mrs. F. T. Norris of Colyton. Very fine Victorian straw bonnet in costume showcase on second floor. A small privately owned Museum; absolutely delightful. Some Corn Dollies on display, maker unknown. A beautifully restored Grade 1 listed building decorated with amazing Victorian stencil work. One of the small wooden panels on the altar in the Lady Chapel depicts beautifully carved ears of wheat. Where you can see various types of lip-work bee-skeps (maker unknown) after you've enjoyed your Devonshire Cream Tea. Note: the Windmill is not open every day. There is a display case of work made by Les Sorrell (1909 - 2001). 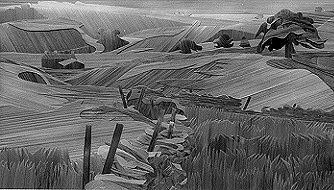 Les was born and lived in Ingastone so it is appropriate that his work is shown at the windmill. The museum opened in 1835 with the ruins of Walden's 12th century castle in its grounds. 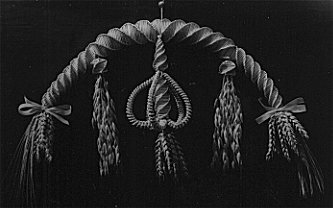 There is a small amount of straw plaiting material on display, and a good selection of Napoleonic prisoner of war work and corn dollies in the reserve collections. Researchers and interested parties are welcome to view these by appointment. Situated in the middle of Perry Wood, a mile south of Selling and similar distance north of Shottenden. (Grid ref. TR042552) Difficult to find, but well worth the effort. 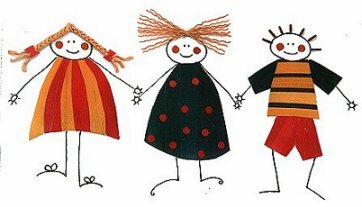 An amazing collection of Corn Dollies to delight you! See article in Guild News 23, Autumn 2000. Opening Hours: Monday - Friday 10.30 a.m. - 1.00 p.m. 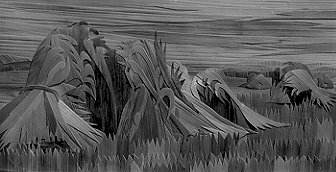 The collection of work by Dorothy Horsfall. Princess Margaret�s 21st Birthday party dress decorated with straw embroidery designed by Christian Dior. Swiss straw lace dress, jacket and bag made by Freda Rudman can be seen in the Challenge Gallery (see article Corn Dolly Newsletter No. 32). From Christmas 2001 to early September 2002 there was a little display with straw work from the Collection of Textiles and Dress. The display was called "Straw - The Blond Goddess". 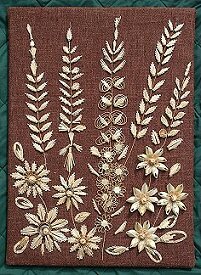 The display included eight items ranging from a straw embroidered image robe (dating from 1670-90) to a straw decorated collar (from 1880s). The display did not include straw hats but concentrated on other ways in which straw is used. In the museum there is a collection of many items of straw related interest, including a lipwork Orkney chair, straw decorated fans and straw marquetry. Many items held in the Reserve Collection, for which you will need to make an appointment. A treasure hunt to find straw items�look hard, they're there! Before you go arm yourself with some fact sheets. The Somerset Rural Life Museum has the Adnams� collection of Corn Dollies. John Adnams and his late wife were taught by Alec Coker at L. Sandford's. Behind the door of the Queen's Bedchamber is a delightful Dutch painting �Friars in a Nunnery�, by Dutch artist Pieter Aertsen (16thC.). One of the monks is sitting in the most beautiful Orkney chair, with a skep work mat for his feet to rest on. 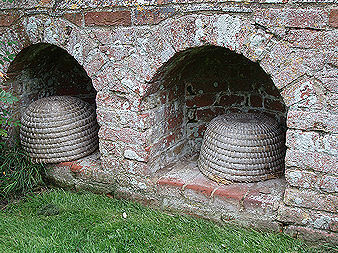 In the walled garden are � bee boles� which contain some straw bee skeps. A good example of lipwork. In an upstairs bedroom, the doorway roped off, a TWIGGEN chair: - A late 18thC lipwork (skep) straw armchair. The high curved back with a pierced border of meander pattern, the enclosed seat raised on a timber frame with five turned castors; English, c. 1750 -1820. An open air museum with thatched cottages. Inside are examples of lipwork in the form of baskets, a straw hat, and traditional corn dollies are displayed throughout the museum. There is also an Iron Age Roundhouse with a thatched roof but this is made of reed not straw. 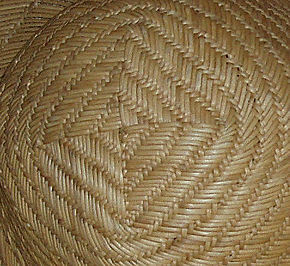 "Detail of the top of a straw hat in the Ryedale Folk Museum "
In the implement building is an example of straw furniture using lipwork. It is a Valet - an aid to enrobing. It was produced as part of a Master of Arts Furniture Design Degree at High Wycombe, and is made with rye straw. You will need to observe very carefully this skep work chair, as only the very lower half is visible under a cloth cover. A wonderful museum to visit with cafe with an ever changing view of the sea. In the collection are fine examples of straw baskets and a skekler�s costume. In the indoor exhibition there is a collection of corn dollies. There are also two silk bonnets from the 1830s decorated with cat's foot plaits. The museum contains a large collection of farm implements. 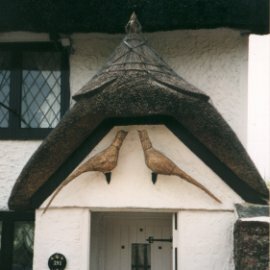 The Kennexstone Farmhouse from Llangyndd (Llangennith), Gower, Swansea has the usual thatch on the outside but inside there is an unusual inner thatch made by locking straws at 90 degrees as in the "Bride" corn dolly. The collections in the museum are of objects either made or used in Ceredigion (Cardiganshire) between 1850 and 1950.